In the combat zone in Donbass region the most tense situations are in the North, in Luhansk Oblast [region] (in the settlement of Stanitsa Luhansk), in Donetsk and the village of Debaltseve, Donetsk Oblast, and in the South (Novoazovsk-Mariupol). The Russian-terrorist forces continue active offensive operations in the Luhansk Oblast. Simultaneous reconnaissance strikes in the town of Mariupol indicates that the enemy is trying to identify the positions of Ukrainian troops in the area to ensure its further offensive action. At the same time the enemy continues to pursue a concentration of units of the occupation forces in Crimea in the northern parts of the peninsula. Helicopter assets are being transferred to the airfield in Dzhankoy. The past few days were marked by a conclusion of the withdrawal of mechanized infantry and artillery units from Crimea through the Kerch ferry crossing into the territory of the Russian Federation, according to preliminary data – for further transfer to the border with Ukraine in the Rostov region of Russia. Last night Ukrainian troops attacked the enemy’s base camp in the village of Veseloe. Three 122 mm Howitzer D-30‘s and the living force of the enemy were destroyed. There are fights in the area of Debalceve. The enemy were shelling positions and outposts of Ukrainian troops in the areas of Stanitsa Luhansk, Luhansk, Nikishin, Stukalova Balka. 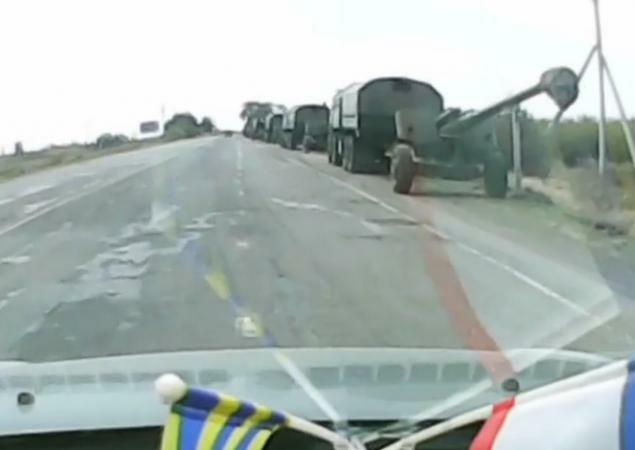 Shelling from the territory of Russia, was carried out onto the positions of Ukrainian troops in Makarovo (from BM-21 Grad) and Nizhny Minchenok (from BM-30 Smerch). The Information Resistance [IR] group has received video verification of its own data on the transfer of Russian occupation troops through the Kerch ferry crossing to further redeployment in Donbas. Earlier, IR reported that the enemy continues concentrating units of the occupational forces in Crimea in the northern areas of the peninsula. Helicopters are being transferred onto the airfield in Dzhankoy. The past few days were marked by a conclusion of the withdrawal of mechanized infantry and artillery units from Crimea through the Kerch ferry crossing into the territory of the Russian Federation, according to preliminary data – for further transfer to the border with Ukraine in the Rostov region of Russia.